Timid is among the pieces by Bruno Walpoth at the ongoing Beijing show. 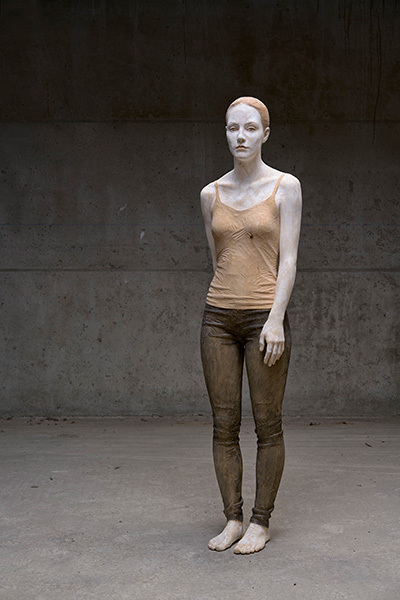 Italian sculptor Bruno Walpoth is holding a solo exhibition in Beijing to display his wood art, Lin Qi reports. Italian sculptor Bruno Walpoth was born and raised in Groden, a valley surrounded by the Dolomites mountain range in northern Italy. Apart from being a known site for rock climbing and skiing, the place has also established its name in woodcarving over the centuries. The wood figurines and children's toys made by local craftspeople are popular in Europe. Walpoth, 60, spent his childhood watching his grandfather, father and uncle carving wood to make art pieces at their family studio. He dreamed of becoming a skillful artist himself. 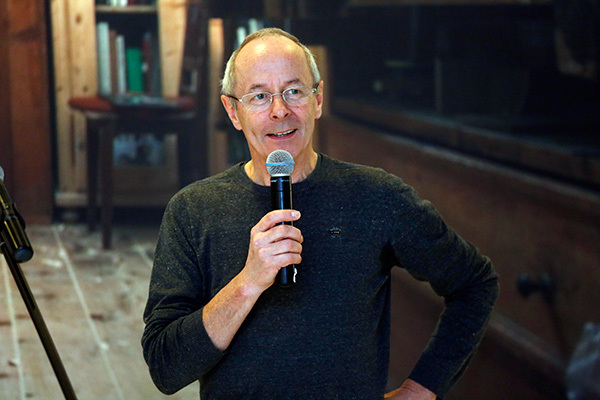 He has achieved the goal of adding glory to the family business and the heritage of Groden. The works he carves in his studio in Ortisei, the town where he now lives in the valley, have been exhibited worldwide, including dozens that are currently on show at his solo exhibition, Mute Encounters, in Beijing. Italian sculptor Bruno Walpoth at the opening of his solo exhibition, Mute Encounters, in Beijing. The exhibition at the Art Museum of the Central Academy of Fine Arts through May 1 charts the course of Walpoth's exploration of sculpting life-size figures since the 1980s. But one can see in Walpoth's works that he doesn't make the same type of sculptures depicting traditional religious and genre themes, which the craftspeople of his hometown do. He has adopted a figurative approach, producing contemporary sculptures that dwell on the current mentality of people. His works evoke a feeling of loneliness and desolation, and a reflection of their own states of mind. What Walpoth relies on to touch people's emotions is an intimate connection with pieces of wood, which he has worked with since boyhood. 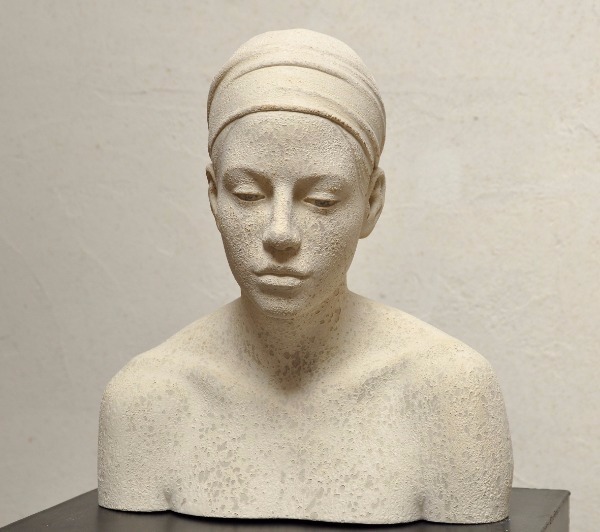 At the age of 14, Walpoth entered a studio in Ortisei to receive formal training in sculpting. For five years he learned how to carve figures of mostly religious and genre motifs, which he, however, felt no passion for. Walpoth realized he didn't want to follow in the footsteps of many locals. He left his hometown, hoping to be exposed to the full spectrum of contemporary art. He enrolled at the Academy of Fine Arts, Munich, one of German's oldest and most distinguished art schools, in 1978. There he studied sculpture for six years. Alexa is among the pieces by Bruno Walpoth at the ongoing Beijing show. "For the first three years at the academy, I shunned wood in my work," Walpoth says, "because I feared that I would be drawn back into the paradigm of thinking and creating what I had learned at my hometown studios". But once when he wanted to complete a male figure during a summer vacation, he could find no better material than a tree trunk. It was then that he knew wood would be an integral part of his work in the future, too, only with the forms and approach of contemporary sculpting. After graduation, Walpoth returned to Groden to teach at art schools while he built his own studio. He continued with the figurative approach, insisting on modeling after real people, although the style was then considered "outdated and abstract, and conceptual art was in fashion", he says.